If you haven't read Daughter of Smoke and Bone yet, I would highly suggest doing so before reading my review of Days of Blood and Starlight. Why? There might be some spoilers from Daughter of Smoke and Bone ahead. However, if that doesn't bother you, feel free to read on. If you've read Daughter of Smoke and Bone you know what Loramendi's current state is, how Karou and Akiva are doing, and that the seraph army is on the move. 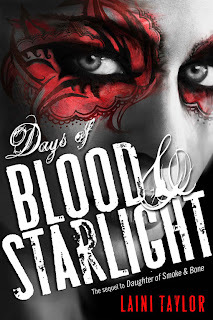 What can you expect in Days of Blood and Starlight? A lot of plot advancement, you'll see more of Eretz, and you'll also be reunited with a ton of familiar faces. As for new faces, the character that really stood out--in my opinion--would be Ziri, the last Kirin, who happens to be in his natural skin. And while I'm not going to go into detail about him, not to worry, you'll be learning a lot about him. Did I mention that Mik and Zuzana continue to be absolutely adorable? Because there's a lot of that too. Expect to switch focal points throughout Days of Blood and Starlight--although not to worry, as it's written in third person it's easy enough to follow along. It enables the reader to see so much more of Eretz than they'd otherwise be capable of seeing and that is extremely important for this book. It also helps set up things for the last book--which I am now dying to get my hands on. I would also like to point out that there were things that I wasn't expecting in Days of Blood and Starlight. Events that take place that really threw me--in a good way, I promise. Received for review via publisher and NetGalley. I am so excited :D That's all I can say, ahah! LOVED THIS BOOK SO MUCH. I lacked the words. Seriously, my own review feels like its all over the place to me. [Mine won't be up until Monday though...] But I just loved this one, even more than Daughter of Smoke and Bone because of all of the different perspectives. They worried me at first but by the end of the book I felt so invested. And now I'm dying for the last one too. SO FAR AWAY.